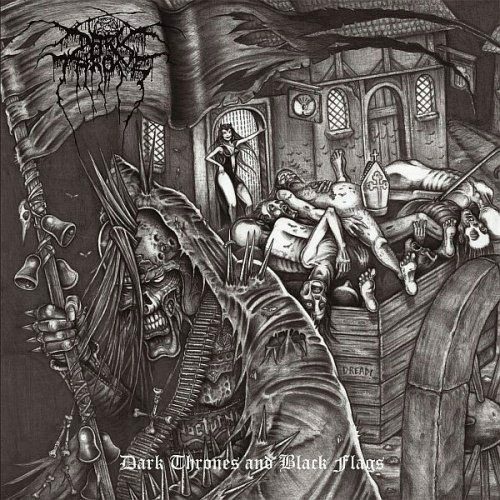 Darkthrone, one of the most renown black metal bands, has released a new album entitled Dark Thrones and Black Flags. The title is so fitting; a mix of punk and black metal. When Darkthrone first released Soulside Journey back in 1990, I doubt they projected their music to evolve to what it has become today. More akin to early black metal’s compressed and distorted vocals, their early work is sometimes difficult to interpret as melodic in any way. To be honest, I wasn’t that much of a fan of their early albums until F.O.A.D. was released in 2007. It’s not that I don’t like their early work, it just sometimes lacks cohesion and adversity. Dark Thrones and Black Flags is almost more punk than it is black metal. Sure the essence of black metal is very much punk, but this album from the onset, screams 90’s punk. The first track The Winds They Called the Dungeon Shaker is the best punk song of the year in my opinion and it comes from a black metal band! Sure many die-hard black metal fans may be upset by the regression of this black metal giant into a punk / metal band, but I look at it as a gradual maturing process for the band. Something that sets this album apart is the fact that each member, well there are only 2 members, has 5 songs accredited to their name. Fenriz’s songs are very much a new ground for Darkthrone, while Nocturno Culto’s contributions are very much traditional Darkthrone. Norway in September reminds me of Venom, while Hiking Metal Punks almost sounds like Motorhead! In the end, in a time where black metal is losing it’s edge and many complain is “selling out”, Dark Thrones and Black Flags offers a swift kick to the balls of the genre. Head out and buy this album today!